Vedic period is one of the most important time for Hindu Religion. Many Hindu religious texts were composed during this time. This period is called Vedic because the four Vedas were composed during this period. Vedic Age began with the arrival of Aryans. There are many conflicts among the historians regarding the origin of Aryans. Though it is believed that Aryans were semi namadic pastoral people and originated from the area of Caspian Sea in central Asia. They entered India through the Khyber Pass of the Hindukush mountain. Vedic period (BC 1500-600) is divided into two periods-early vedic period (BC 1500-1000) and Late Vedic period (BC 1000-600). 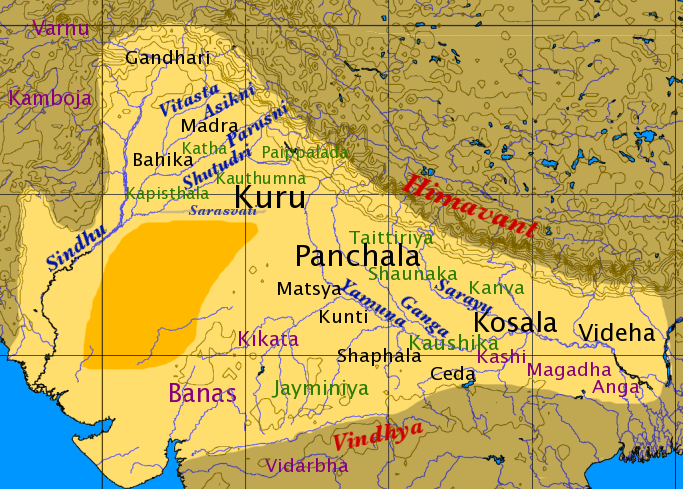 Aryans first settled in the west-north side of India ( Afghanistan, Punjab,Uttar Pradesh). Mainly in the land of of seven rivers. In the beginning, Aryans had many conflicts with the native Dravidians. But when the Dravidians were unable to meet the challenge, they gradually moved southwards. During this time there were no big kingdoms. People lived in the tribes or small kingdoms. There were families or kulas headed by kulapati, villages or grama headed by grammi. Women had a respectable place in the society. They had the right for education and to participate in religious ceremonies. At that time cattle were used as currency. Gold and silver were used to make jewellery. Agriculture and cattle rearing were the main profession at that time. During this time four fold caste system ( brahmin, kshatriyas, vaishyas, shudras ) was existed. Brahmins were prist, teachers. Kshatriyas were rulers,solders. Vaishyas were traders. Shudras were workers. Aryans expanded their area and they entered in the gangatic plains also. During this time small kingdoms became large. Large kingdoms like Kosala, Jury, Magadha, Kasi etc came into existence. Several wars were fought during this time. Women lost their social status and dignity in the society. They were not allowed to participate in the public affairs. Kings became very powerful. The gap between Kshatriyas and vaishyas increased. Trading was increased. External trading was also started in this time. Several royal ceremonies - rajasuya, vajapeya, ashvamedha yagna were performed at that time by the kings. Two Great epics Ramayana and Mahabharata were also written during the late vedic period. RigVeda It is the Oldest of all the Vedas. It contains the Gayatri mantra. It has 10 Mandalas and 8 Akhtaks. Among the mandalas, 10th mandala was added later. YajurVeda This Veda contains procedures for sacrifices and rituals for yajnas. This is a prose Veda. It is divided into two groups – Black (Krishna) Yajurveda and White (Shukla) Yajurveda. SamaVeda Samaveda is a veda of Chants and melodies. AtharvaVeda This is the youngest veda. This veda was added later in the vedic literature. This veda contains the procedures for everyday life. The different brahmanas are associated with a veda. Aranyaka describes the philosophies of the Vedas. Upanishada This is one of important literature of Hinduism. It discusses the philosophical ideas of Brahman and the path of Moksha. There are about 200 upanishadas. Among them only 12-14 are considered as important. Such as - Isa, Kena, Katha, Prasna, Mundaka, Mandukya, Taittiriya, Aitareya, Chandogya, Brhadaranyaka, Svetasvatara, Kausitaki, Mahanarayana and the Maitri.